Valley Pines Assisted Living, a state licensed non-medical facility #430702352, is owned and operated by James and Carolyn Heinan and operated by James and Carolyn Heinan. 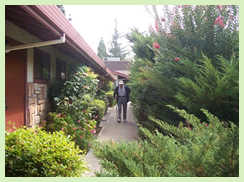 Valley Pines Assisted Living is nestled in a beautiful neighborhood in Morgan Hill. We're local and family-owned, providing seniors with quality care for over 30 years. You can visit us at 545 E. Main Avenue, Morgan Hill, Off Highway 101 and Butterfield Boulevards. The round-the-clock care offers our residents proper diet, daily exercise, companionship, administration of prescribed medication, bathing and personal care assistance and transportation - all this in a pleasant atmosphere. The rooms are located off a wide hallway with chandeliers hanging from the high arched ceiling. Most rooms have direct access to the landscaped patio, gazebo and aviary. Some rooms have a bench outside and an area for flowers or a small garden. You may bring your own furniture or we will furnish your room for you. Bathrooms are safely equipped with shower rooms accessible to wheelchairs. Round-the-clock staffing and security is also provided. Our spacious, community oriented dining area makes meal times enjoyable for everyone. Residents are always welcome to have guests join them for meals. Oak paneling, elegant furniture, comfortable seating and a warm fireplace make our living room a comfortable place for a variety of activities. Valley Pines organizes birthday and holiday parties with friends and family always invited to join in the celebrations. We offer transportation to appointments and doctor's offices. Valley Pines is centrally located along a public transportation route minutes from downtown, the senior center, library and medical facilities. If you prefer, you may provide your own transportation. We have ample parking facilities. 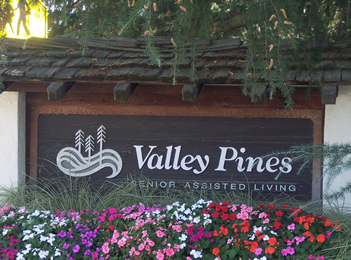 For more information about Valley Pines, or to schedule a personal tour, feel free to call us at 408-779-2855.